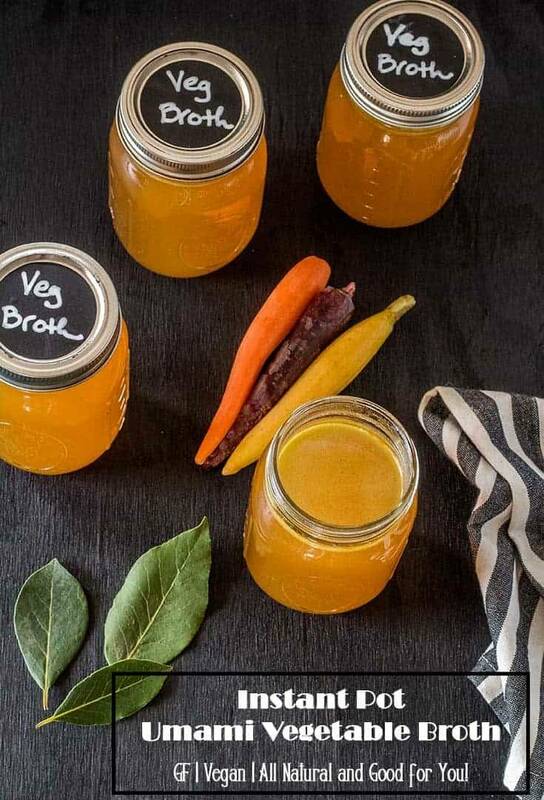 Have you found vegetable broth to be bland and lacking in flavor? Instant Pot Umami Vegetable Broth may challenge that perception! Adding some umami ingredients to the mix and roasting your vegetables adds complexity and depth to the broth, and your Instant Pot/pressure cooker gets it done in less time! I’ll bet you can think of a few arguments against making your own broth and stock? 1. It takes too long! 2. It’s pretty cheap to buy! 3. It tastes fine. I hope to address each of these points in this post, and perhaps I’ll have you making your own? Homemade broth/stock ALWAYS tastes better than store bought, but nowhere is the taste difference more obvious than with a vegetable broth. IMHO. And, not all recipes are created equal! The problem with many commercial brands lies in both the quality and quantity of the ingredients. Vegetable broth can taste completely flavorless, and the flat taste will do nothing for your recipes. The combination of onions, celery, carrots, and garlic that goes into a typical commercial vegetable broth is rather one-note. Many recipes for homemade don’t go much further in adding flavor to the broth. 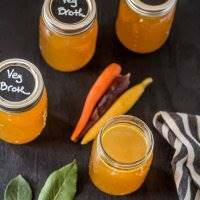 While making broth/stock is a great way to use vegetables past their prime, the broth really benefits from fresh produce as well. I typically do a combination of fresh and frozen and wilted produce. Commercial broth – whether it be vegetable, chicken, beef, or seafood – is likely to contain flavor enhancers like corn syrup, lots of salt, and a few ingredients you can’t even pronounce. Yuck. You choose (and know) what goes into your stock pot when you make it at home! Another important factor in making homemade broth/stock is the quantity of ingredients. If you want the broth/stock to add flavor to your recipes, it needs to be full-flavored. I pack the vegetables into the pot (whether I’m doing Instant Pot, stove top pressure cooker, or traditional pot). I add only enough water to cover the vegetables. The resulting broth/stock is full-flavored and delicious. Since you’re not relying on bones for flavor with vegetarian broths, the process is a little quicker. I do 30 minutes on high pressure, keeping in mind the time on the front end (about 10 minutes), and a 10 minute wait time on the end before releasing pressure. Mushrooms (including stems). They’re not “vegetables” but they’re awesome in broth/stock! At any given time, I have a freezer bin full of vegetables that I’ve saved in zip bags for broth/stock. Some may be wilted, but sometimes I just realize they won’t get used before I might not want to use them fresh (like when I leave town). I also have zip bags of onion tops and bottoms with their skins, the tough part of leeks, any part of appropriate vegetables that I don’t want to use in a dish. I even freeze bits of fresh herbs; parsley is particularly good. My absolute favorite ingredient for a vegetarian broth is mushrooms, so I save the stems and wilted mushrooms in a separate zip bag. Have you seen my Roasted Mushroom Stock? I even save the liquid from rehydrating dried mushrooms (when it isn’t needed in the dish)! Mushrooms are an essential part IMHO of making a good vegetable broth as well. They add depth and umami flavor to the broth. I actually use mushrooms in any broth/stock other than seafood or shrimp stock. Maybe I’ll try that someday too? In addition to the frozen scraps and bits, I add fresh vegetables when I have them – carrots, tomatoes, onions and leeks, parsnip (never more than 1), the woody stems of asparagus, green beans, snap peas, etc. I always add a couple of bay leaves, and some fresh parsley if I have it. I typically keep my broth/stock flavor profile basic. I don’t add ginger, specific herbs like thyme and rosemary, or other ingredients that may limit its use later on. I can add those ingredients when I make the dish. I almost always roast my ingredients for any broth/stock as the maillard reaction also adds umami flavor. Yes, it adds to the time, but keep in mind you’ll end up with about 8 cups of amazing stock, and you probably won’t have to make it every time! I lay out my prepared ingredients – a combination of fresh and frozen – on a baking sheet. 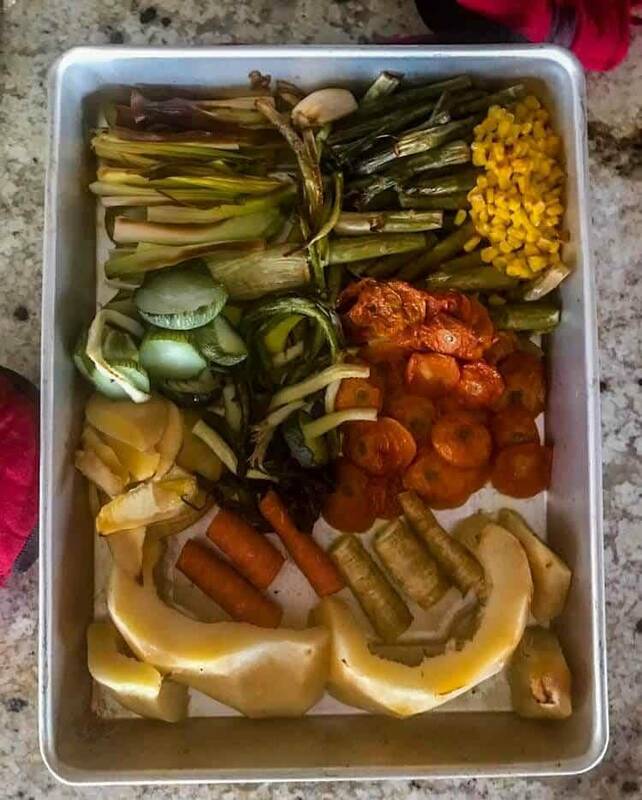 They roast in a 400º oven until the vegetables have a good amount of brown on them (30-45 minutes). NOTE: Do not include greens on your roasting pan, rather add them to the Instant Pot/pressure cooker when you add the roasted veggies. Roasted veggies are softened, and you can pack in more. More veggies equals more flavor! Add both roasted vegetables and other ingredients to the IP/pressure cooker, pressing them down to get them all in there if necessary! 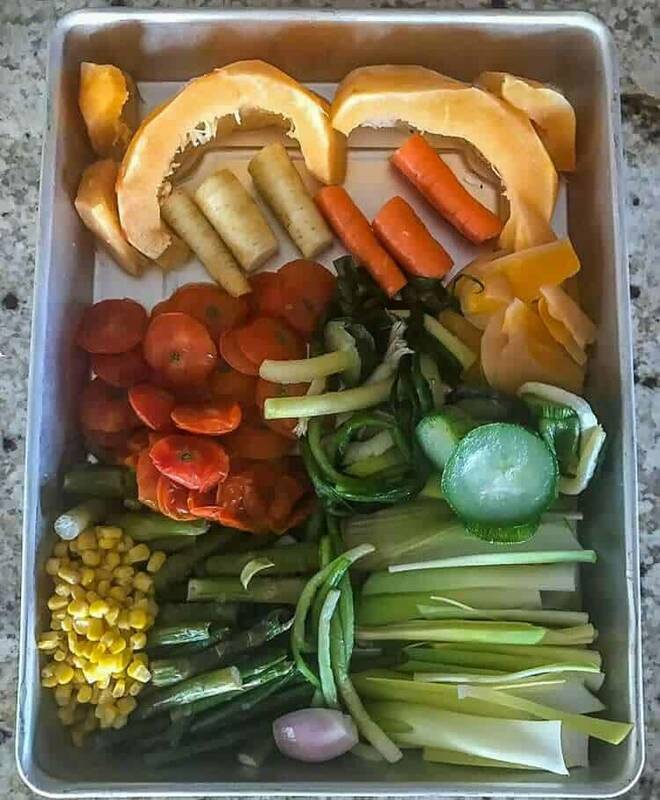 Add water to just cover the vegetables, keeping in mind the fill level is 2/3 to 3/4 full. NOTE: Stock can be made 4 days ahead. Cover and chill, or freeze up to 6 months. 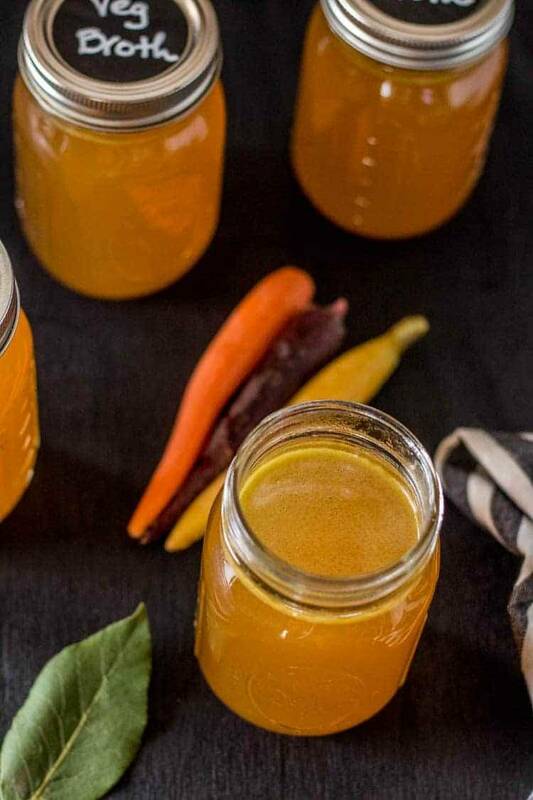 Use this full-flavored Instant Pot Umami Vegetable Broth in your favorite dishes. I think you’ll find the effort is worth it! If you’re looking for a vegetarian broth with a completely different flavor, check out my Roasted Mushroom Stock. 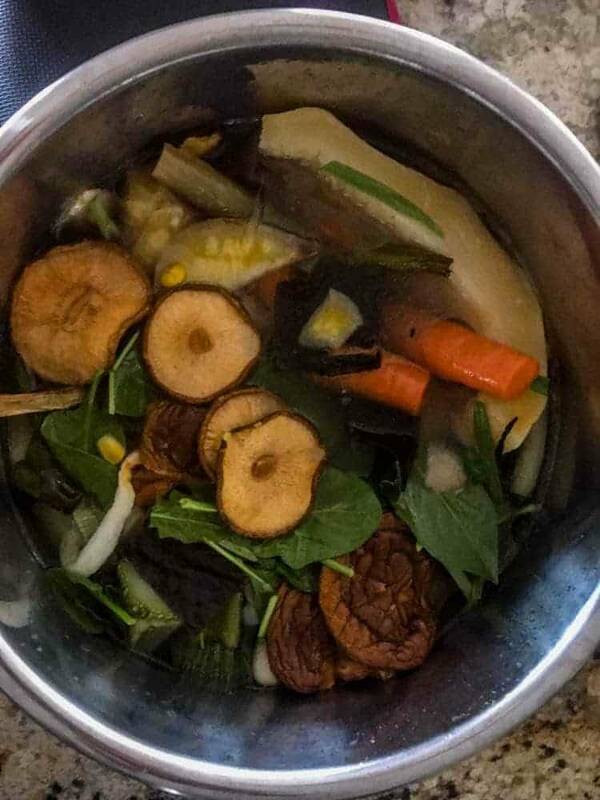 Umami ingredients (kombu and mushrooms) along with roasting the vegetables provides depth and flavor to this vegan broth. Make it in less time with your Instant Pot/pressure cooker! Preheat oven to 400 degrees (375 convection). Arrange vegetables (except greens, kombu, and dried mushrooms) on a large baking sheet. Roast them until many edges are browned. If you start with frozen and partially thawed vegetables, this will take additional time. Add the roasted vegetables, kombu, dried mushrooms, and greens (if using) to the IP/pressure cooker pot. Press them down to keep them below the fill line (about 2/3 to 3/4 full on most models). Fill pot with water even with the top of the vegetables. Too much water means weak broth. Lock lid, and set for 30 minutes. Allow 10 minutes before releasing the pressure. Allow it to cool some before straining. Strain stock through a fine-mesh strainer into a large bowl; discard solids. Pour into mason jars or container of choice until ready to use. I like mason jars until it needs to go into the freezer. Zip bags are my preference for freezer storage. Stock can be made up to 4 days ahead. Cover and chill, or freeze up to 6 months. Note: I typically don't salt my broth/stock until I use it. Other ingredients in the recipe may impact the amount of seasoning used. As I mentioned in the post (you did read it right? ), carrots, celery, onion, and garlic make a "one note" broth. Avoid really strong flavors, and focus on milder, sweeter vegetables with a lot of variety. I go into far more detail in the post! I've made my own beef, turkey and chicken broth, but never a vegetable broth. 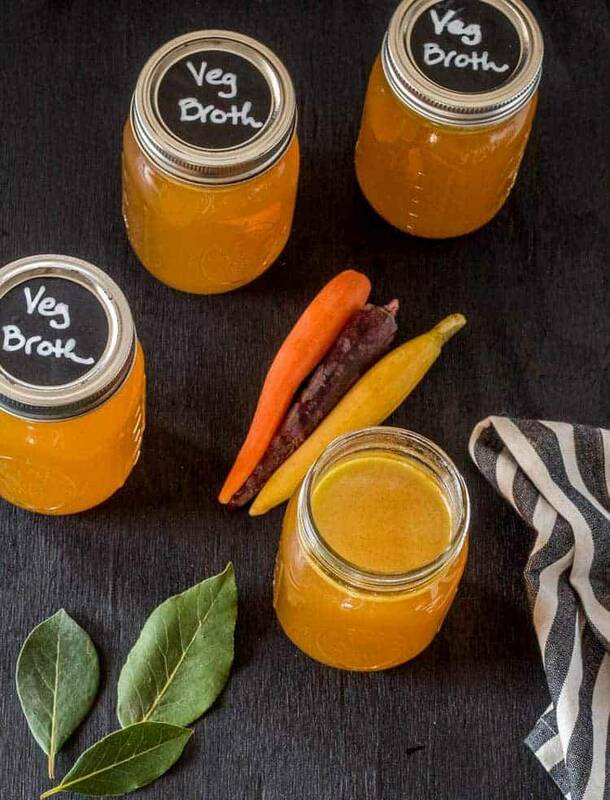 Your recipe looks awesome and your broth is such a gorgeous color. Thanks for sharing! Tammy - this is such a good post. My mind had been on the stock lately. I am so trying this recipe sans roasting. Call me lazy. Sharing it. Haha! If you find it somewhat lacking, don't blame me... ;-) Thanks for your comment (and sharing) Sonal!